Earlier this week, President Donald Trump signed into law the Iraq and Syria Genocide Relief and Accountability Act, which will help the United States channel humanitarian and rebuilding assistance to Christians and other religious minorities in Iraq and Syria. According to Crux, the bill, which was first introduced two years ago, authorizes funding for both faith-based and non-faith-based groups aiding recovery in the region and support for investigations into members of ISIS who perpetrated genocide. The bill also encourages "foreign governments to add identifying information about suspected ISIS perpetrators to security databases and screening and to apprehend and prosecute perpetrators." Rep. Chris Smith (R., N.J.), who introduced the bill, emphasized the importance of saving evidence to prosecute ISIS perpetrators of genocide. "You have to capture, save, chronicle the evidence or else convictions are not forthcoming," Smith told the Washington Free Beacon. One of the primary goals of the bill, he added, is to ensure "every way of effectively prosecuting war criminals for the genocide can be forthcoming." The bill's signing comes a little over a year since Vice President Mike Pence told a conference hosted by the nonprofit In Defense of Christians that the United States "will work hand in hand with faith-based groups and private organizations to help those who are persecuted for their faith." In July, the Trump administration established the Genocide Recovery and Persecution Response Group within USAID to aid victims of persecution. A few months later, USAID and the Knights of Columbus agreed to collaborate on efforts to aid religious minorities in the Middle East. In October, the State Department outlined its support efforts for ethnic and religious minorities in Iraq, announcing "over $178 million in U.S. foreign assistance to support these vulnerable communities in Iraq," bringing "total U.S. assistance for this population to nearly $300 million since Fiscal Year 2017, implemented by both the State Department and USAID." Approximately one million Christians have left Iraq since 2002, leaving fewer than 250,000, most in the Nineveh Plains and Iraqi Kurdistan regions. 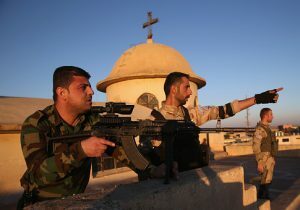 As of June, 39,914 individual Christians and 8,815 families had returned to the Nineveh Plains, and 4,765 houses had been restored, according to the Nineveh Reconstruction Committee. By early November, an additional 200 individuals and families had returned, and another 1,000 homes had been restored. More than half of the Christians living in the region prior to the rise of ISIS have still not returned. In some towns, rebuilding has progressed significantly. In Telleskuf, for example, over 70 percent of families formerly living there have returned. Bill O'Keefe, vice president for government relations and advocacy at Catholic Relief Services (CRS), told the Free Beacon life in Telleskuf "is back to some semblance of normality." In June, USAID announced $10 million in funding for an umbrella group headed by CRS. O'Keefe said CRS has concentrated "on shelter, education, and livelihoods." Aside from security, O'Keefe said returning religious minorities and others in northern Iraq "need a place to live, they need a place for the kids to go to school, and they need to restart some form of income generation." Progress in the city of Qaraqosh has been slower: Just over half of families have returned, but less than 40 percent of houses have been rebuilt. In Karamless, just over 40 percent of all families have returned, and about 50 percent of all homes have been restored. Access to clean water continues to be a challenge in Qaraqosh. An October report noted that water sourced from Mosul is "dirty and inconsistent," and that "whenever there is a lack of water in Mosul, officials will cut Qaraqosh's water supply first." O'Keefe observed, however, that "the sense of momentum" on the ground in Qaraqosh is "positive." The situation is worse in Batnaya, where only two families have returned as of November. Back in June, Crux's Ines San Martin reported that "there's virtually nothing to go back to, raising the question of why any of its former residents would ever want to return." The road to Batnaya was recently reopened, however, which Max Primorac, USAID's special representative for minority assistance, called "a game changer" for recovery efforts. Apart from rebuilding communities, security and freedom of movement present key challenges to rehabilitating the region. Militia forces have set up checkpoints which, O'Keefe says, "make it very difficult for people to move around." Communities also do not feel secure when outside militia forces control security in their town. "For people to be comfortable, there needs to be a sense of … home rule or local control of the police, of the local security, of the local government, municipal infrastructure," said O'Keefe.